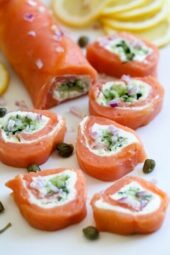 I love smoked salmon, especially Nova Lox with cream cheese so this appetizer has my name all over it! A few other smoked salmon, it’s a must when I set up a Bagel Bar for brunch, and in recipes like this Breakfast Omelet with Lox, and Avocado Egg Salad Toast with Lox. 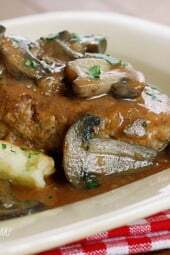 This recipe is from the Everyday Ketogenic Cookbook (affil link) by Carolyn Ketchum. 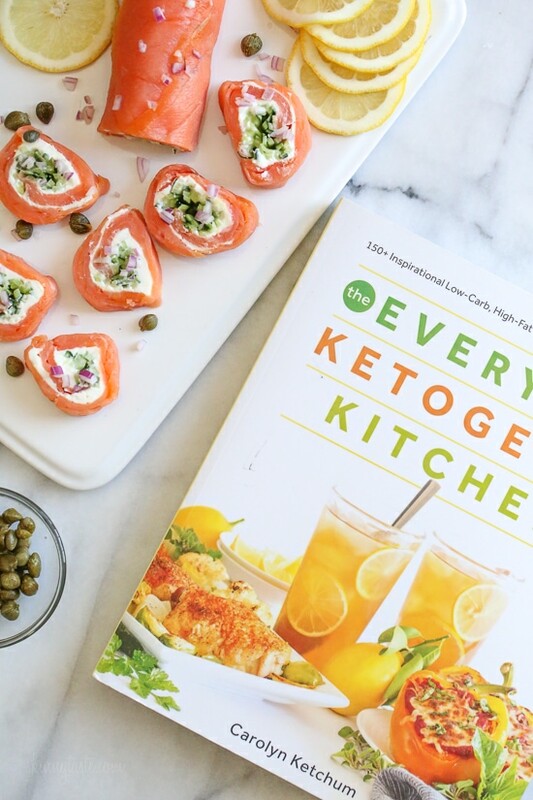 A fabulous cookbook and a great resource for anyone wanting to live a Ketogenic lifestyle. This recipe is perfect to make ahead for a party, keep them refrigerated until ready to serve as they hold up best when chilled. You can make them a day ahead, I think they would also be wonderful with fresh dill. Roll it in everything bagel seasoning before slicing it. I nuke the cream cheese, 30 secs 1/2 power to make it easier to spread. Put onions inside with lemon juice and dill. This looks mind blowingly good, but…I would use the greek yogurt cheese, meaning even less calories and fat. It tastes exactly like cream cheese. I’ll never eat cream cheese again. All I do is take fat free Greek Yogurt and strain it in cheese cloth overnight. That’s it. Easy peasy. What do you think about putting the red onion and capers in with the cucumber before rolling? 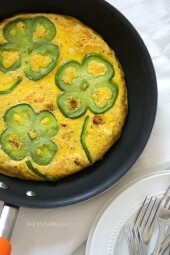 I’m going to make this and actually have it for my breakfast for the rest of the week- excited to try! My favorite cold smoked salmon is made by Ducktrap . they have many different flavors. I buy it at Whole Foods but also many other retailers too. I like their peppered as well as the plain. 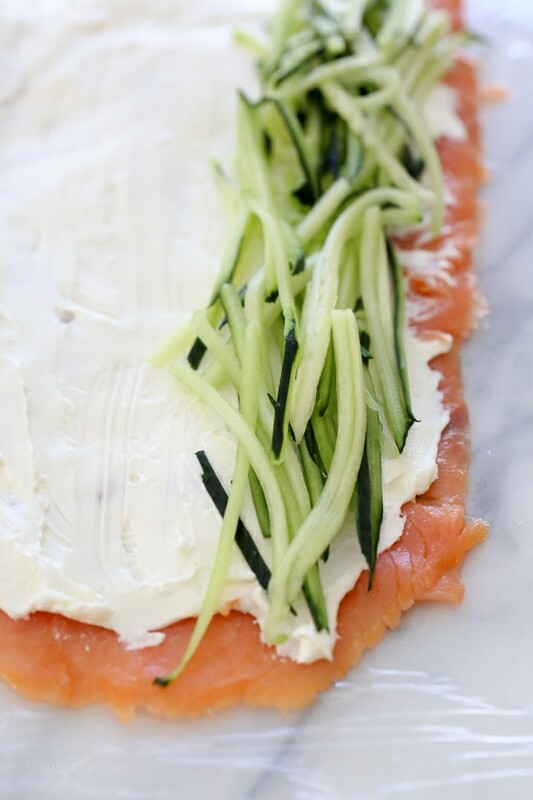 I had trouble getting the cream cheese to spread without ripping up the salmon — I used the block kind. Should I have used the spread kind? I added dried dill weed, just a sprinkling, before step 4. I made this as an appetizer for Easter dinner! The plate was empty in no time. A definite winner Thanks! 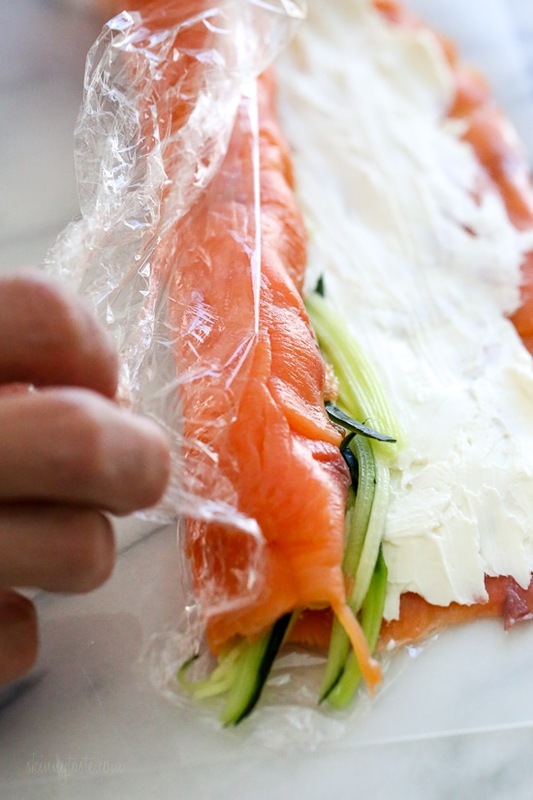 Where can I find the salmon at whole foods…its called Lox? I’ll be trying this on the weekend and Instead of cream cheese I think i’ll skinny cow spreadable pepper jack cheese? Add a little heat! This looks like a perfect appetizer for Easter to bring to a potluck! Thank you Gina! I make a yogurt “cream cheese” by draining fat free Greek yogurt, then seasoning what’s leftover. I use it in baking, A LOT!I recently made some “lox and cream cheese” where I added scalllions, capers, salt and pepper, and came up w/a true winner.Made w/my zero point cream cheese (ff plain yogurt is now zero), Gina, your dish would be zero points. Trust me, It’s delicious! 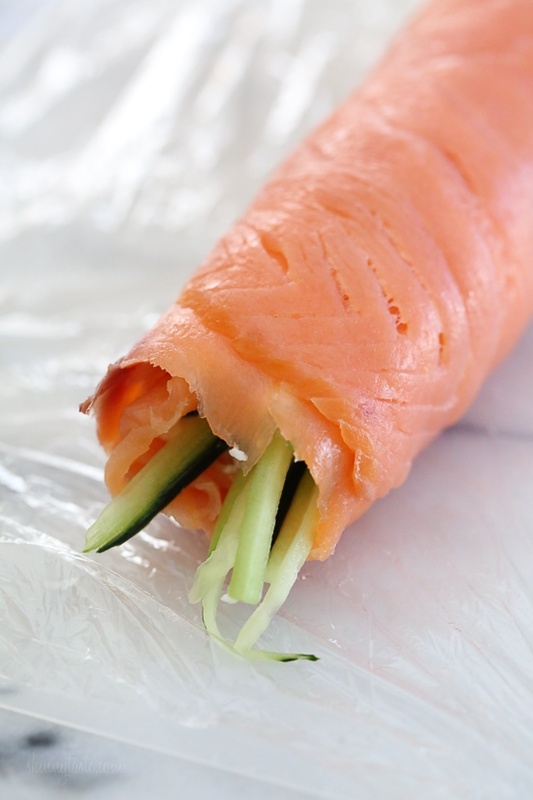 what tool do you use to slilce the cucumber so perfectly….. The shredder blade on my Paderno spiralizer made strands in just a few turns. Even though I’ve decided that I will try block (rather than tub) cream cheese next time to help the roll hold together more tightly, I was pleased with the taste of these. I did add fresh dill sprigs, and the red onion and capers give the finished slices not only a festive garnish but some valuable zing. Thank you for an interesting recipe. These look amazing! Might be serving these soon! Done and DONE!! I need a low carb make ahead dish for Easter brunch with my family and this is the first place I looked! I should have known you wouldn’t let me down. Happy Easter to you and your family! Thanks for all the delicious recipes! These are delicious!! 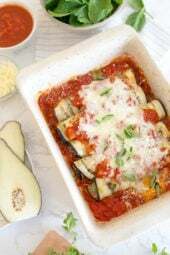 Carolyn Ketchum is a fabulous recipe developer. Her cookbook The Everyday Ketogenic Cookbook is a culinary masterpiece for Keto and lowcarb lifestyles!! Thanks for posting her recipe! I have a few questions….. Is smoked salmon cooked? Or is this considered raw fish? Also, how do I get thin cut salmon? Thank you so much and I’m so very thankful I found your website! Yes, it is cooked. It comes sliced thin. I find it in the seafood area of my grocery store, Publix. No actually it is not cooked. It is cured in salt then cold smoked. However it’s not raw like sushi. The cold smoke flavors the cured fish at about 99° f. The curing makes it safe to eat, similar to dehydrating which also uses a very low heat to dry it out, which is how beef jerky is made. Beef jerky is not cooked either. I’m a food safety inspector for the USDA. I don’t deal with salmon, but I inspect meat products, and Jerky is absolutely cooked. Due to issues with slow come-up times increasing the chance of salmonella growth, jerky is generally cooked to 160 F in large smoker ovens. Just an FYI. Did you use the tub or block cream cheese? Just curious which works better. For my first try, I used a half tub of lower-fat cream cheese. It was reasonably easy to spread (though I had to go slowly and carefully), but I think that the roll would have held together more firmly if I had used a softened block that would return to a tighter texture.